Lorna Jane is an Australian retailer specialising in fitness fashion for women. Shop at Lorna Jane online to browse catalogues and weekly ads for hot deals on tanks, tops, sports bras, shorts, jackets, pants, accessories, books, and much more. 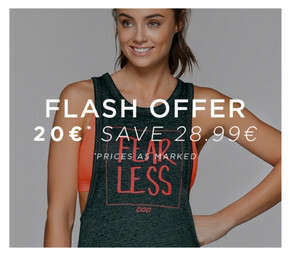 Shop at Lorna Jane online for sensational savings! All orders over $150 will receive complimentary free shipping to locations within Australia or New Zealand! Plus, join the LJ Sisterhood to stay up to date on the latest styles and trends. And what’s more, if you sign up to Lorna Jane’s Active Living Rewards, you’ll be entitled to a range of great benefits including 200 bonus credits (to use towards instore rewards), healthy recipes, lifestyle tips, exciting workouts, reward vouchers, offers with partner organisations, and much more! Give your loved on the gift of choice with a Lorna Jane Gift Card! Choose between a physical gift card (delivered by post) and a digital gift card (delivered by email). Plus, you can add any value from as low as $20 to as high as $500! Visit the Shopfully website and app for up-to-date information on store locations, trading hours, and to browse the latest Lorna Jane flyer.